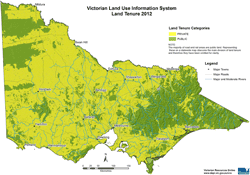 The Victorian Land Use Information System (VLUIS) dataset has been created by the Spatial Information Sciences Group of the Agriculture Victoria Research Division in the former Department of Environment and Primary Industries Victoria. The method used to create VLUIS is significantly different to traditional methods used to create land use information and has been designed to create regular and consistent data over time. It covers the entire landmass of Victoria and separately describes the land tenure, land use and land cover for each cadastral parcel across the state. The land cover data is sourced (created) annually whilst the land tenure and land use data is available bi-annually. This means that the VLUIS 2010 dataset is comprised of 2010 land tenure, use and cover information, while there is only land cover information updated in 2011. The same applies for the 2006/07, 2008/09, 2012/13 and 2014/15 datasets, with each dataset having only one year of land tenure and use and two years of land cover information. From 2016, the VLUIS will be published annually highlighting known changes to land use and land tenure from the previous year's publication together with a complete update of mapped land cover. The data is in the form of a both a table and a feature class. The table contains a Parcel_PFI column which links to the same code within the state-wide cadastral data layer so that data on land use, land tenure and land cover is attached to each land parcel. (is the land tenure, use and cover)? (is the land tenure and cover)? (was the land tenure, use and cover present)? This makes the data useable for an extensive range of application in government, university and industry groups. Land tenure is the form of an interest in land. Land use means the purpose to which the land cover is committed. VLUIS uses the Australian Valuation Property Classification Code (external link) to classify land use. Land cover refers to the physical surface of the earth, including various combinations of vegetation types, soils, exposed rocks and water bodies as well as anthropogenic elements, such as agriculture and built environments. Land cover classes can usually be discriminated by characteristic patterns using remote sensing. The Victorian Land Use Information System dataset is not about supporting compliance – it is a strategic product. The dataset will collect and maintain only the basic “what, where and when” of land information and provide this in an accurate and consistent manner. Therefore, the dataset is not limited to any particular use case and instead supports many uses by answering key questions often only a few steps removed from the question being asked. The potential uses of reliable and repeatable land use, land cover and land tenure dataset are endless. Through the provision of a package of data relating to any size area of interest (from mesh block to state-wide) the land use dataset will answer basic questions about the number, distribution or composition of land uses, land covers and tenures, which can then lead to more strategic questions and objectives. What is the land use, land cover and land tenure and where? Using multiple dates - are these - changing in composition and space over time? Where are the critical biodiversity assets? What is the surrounding land use/cover? Is the land use/cover changing? What are the greatest risks to the preservation of these critical assets? Where are all the dry land cropping farms? How much area is under cereals? How much area was under fallow in 2001? What is the erosion risk? What land cover exists in rural residential areas and surrounds? Is this a fire risk? Vineyard grower notification of planned burning. Extended metadata and symbology files for the data have been made available. 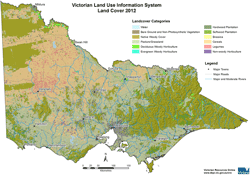 The Victorian Land Use Information System (VLUIS) Metadata description has been provided as an online Word document. The Victorian Land Use Information System (VLUIS) Shape files have been proved as a LYR files. Spatial datasets are freely available for download from the data.vic.gov.au website. Click the links below.